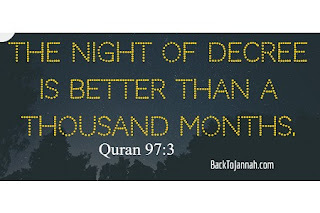 The night of Laylatul Qadr (the Night of Power / Decree) in Ramadan is of great significance. Holy Quran was sent down in this night. Angels descend in this night. This night is better than a thousand months. Whatever good deeds you do in this night, it’s like you did it for 1000 months or 83 years! Authentic hadiths say Laylat-al-Qadr happens in the last 10 days of Ramadan (in an odd night). There is strong scholarly opinion that it is mostly on 25th, 27th or 29th night of the Ramadan. Don’t miss it! Repeat all these again and again like you may not get another Ramadan or Lailatul Qadr ! Look for Lailat-ul-Qadr in the last ten nights of Ramadan. I see that your dreams agree regarding the last ten (nights of Ramadan). So seek it on an odd number (of these ten nights). Seek it (Lailat-ul-Qadr) in the last (ten nights). If one among you shows slackness and weakness (in the earlier part of Ramadan), it should not be allowed to prevail upon him in the last week.